Did you know that even guitar makers cared so much about letters? We’re making a custom bass guitar with an inlay in mother of pearl between the pickups on black. The inlay is in remembrance of the customer’s mother, Kay. At ﬁrst this didn’t seem to be a diﬃcult task, we inlay names all the time. But Kay is especially diﬃcult. Anything that looked “pretty” we encountered the descender of the y clashing with the K. Without any other contextual clues, many ideas looked like initials KAY. Many of the forms have to remain somewhat chunky to reduce the chance of snapping the shell while cutting with the saw. Ends can ﬁnish to a very sharp point, but a thin isthmus (like the bar on an A) is very fragile. Mica, this is a fascinating process. First, some Suggestions: You may ﬁnd that increasing the size of the A and Y helps generally. The other thing that I see, is that the Y doesn’t really ‘match’. Perhaps reshaping the Y would help. I would be tempted to try recalling the shape of the leg of the K or the bulgy left side of the A and applying it on the left arm of the Y or its tail. I also think that the A if made larger would create a nice spade shaped negative space with the foot of the K.
BTW: you’ll ﬁnd faster uptake if you need input about speciﬁcs if you post in Critique, but this shows process a lot so the cross-over is natural. Just how large is a design like this? Must it ﬁt between/in a fret (no I don’t know the proper way to refer to this…) and just how wide is that? Do you have diﬃculty if a name or word exceeds a certain size i.e. William — would that have to be reduced to Will? Could you do William small enough to ﬁt within a fret? You mention that thin isthmus would present a problem, but sharp points are ﬁne. Can you share the reason for this? I think the hand drawn curviness is neat, especially when I imagine it in the context of a curvy guitar. I like the hint of Rolling Stone. Thanks for your input, Jon. The y has been the stumbling block on this project. None of us at the shop are happy with it either, so at least I’m glad to know we’re not alone in our opinion. Back to the drawing board! The Critique area seems more speciﬁcally gears toward font creation, and so I wasn’t sure where it would ﬁt in there, but yes, I notice that region gets alot more attention. 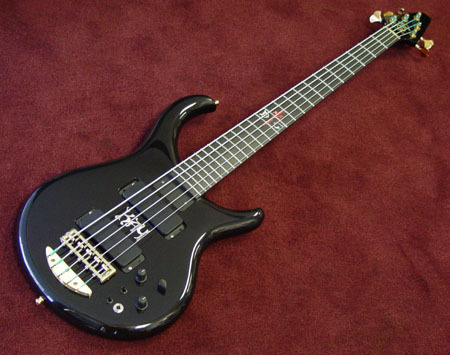 The design has to ﬁt between the pickups on a bass guitar. It’s sort of an unusual location. This area is about 2 inches high and 5 inches wide. It’s placed under the strings where the player’s right hand plucks the strings. Depending on where we put the inlay, there are limitations on size. A common place to put a decorative inlay is the 12th fret — it’s the center of the string and marks the octave. It’s a small space, typically only 5/8 x 2 inches on a guitar and 7/8 x 2-1/4 inches on a 4-string bass. You can’t go to the edges, the designs look better with a buﬀer sround them. You have to consider where the string will fall once they’re installed too. If a name or other personalization would be too big to inlay, we engrave mother of pearl scrimshaw style. That allows ﬁner detail than you can do in a regular inlay. Wow! Thanks for taking the time to photograph the work and sharing it here. That’s so much closer to sculpting type than a lot of modern typographers get. I see the break between the a and m. What do you do when that happens on installation? Do you take it out and cut a new one and re-install it? What about the glue? I don’t know why more people aren’t swarming around here…this deﬁnitely has chirographic heritage but the cutting of the inlays and the fact that you embed letters into insturments is just so…so…well COOL…I love this. Your project is very appealing, both as a type project and an instrument. Have you tried: tilting the downstoke of the A just slightly oﬀ the vertical toward the Y and then swelling the downstroke of the Y to make more of a U shape. This would help to reduce the neg space between the two letters. I don’t ﬁnd the neg sapce between K and A to much. I am an amateur jazz cornet player, and I love working with wood, so I sort of fell into starting to build a steel string acoustic guitar. I don’t know how to play the guitar, but I didn’t see that as any reason not to make one. I will see if I can learn how to play basic rhythm once it’s ﬁnished. My point: you might consider getting your hands on a small pantographic engraving machine. The manual models are now quite cheap, since the industry is switching to computer assisted models. The advantage to the pantograph is that you can work large to start. Your tight pencil drawing is photocopied into a good quality Strathmore 2-ply bristol, and you cut it out cleanly with a sharp X-Axto knife. You can save the negative area and this becomes the pattern fpr the sink that you will be cutting. Both parts are pasted to a thick matte board as separate pieces; positive and negative. These two are traced witha stylus on the panto as whatever reduction you require, and you cut about 1/64” in depth into a good rigid material like aluminum plate or some workable metal. This is the working pattern. You make a working pattern for both the sink and the inlay material. If you use the same sized cutter for both patterns, they will be very accurate and precise. Once you have the two working patterns made, these ﬁt onto the pantograph separately and you then make the sink in the guitar material, whether it’s wood or phenolic or whatever. Next you angrave the inlay material using the same cutter and the ﬁt is perfect. To make it stable and unmoving the inlay material is glued to heavy laminated chipboard with white glue and left to dry a few hours. Ths piece goes on the panto for cutting. When you are ﬁnsished you can lift the inlay by soaking until it releases from the cardboard material. If you want a little loosensess to the ﬁt of the sink and the inlay this can be done by tweaking the size of the stylus that you use when cutting the sink, and the hole will come out a few thou, more open to let the inlay pop in so that it is not so tight as to crack when you are apressing it in. I’ve tried this with some rigid plstic in place of the abalone that I intend to use, and it cuts ok but it could be a little less gummy for better results. Pearl or abalone should cut very cleanly. With this method you can have considerably ﬁner lines (the cross stroke in the A in KAY). You will not lose the handmade feeling in you work by doing it this way, it will just give you work more reﬁnement. If this is not too nutty for you, email me and I will give you some leads on what to look for and where. By the way; if you look up the ATypI 2004 on the web you will see a photospread that John Hudson did on my cutting of the keepsake for the Conf. This will give you some idea of the process if you are not familiar with it. I ﬁnd it nice that so many of us do other things along with typography, and that makes this Forum so much more fun than simply talking shop. Agreed Jon, this is a cool thread. Love inlay work! Jim, your advice about the AY is a great. Mica, in addition, consider ending the left leg of the A at the baseline. That will better frame the design between the swash leg of the K and the tail of the Y. Rotate the K 180 degrees as a starting place for your Y (this is what Jim is talking about giving the Y a more U shape). Mica, do you always hand letter and design your inlays? Do you ever have requests or even oﬀer designs using type? Is there more than one designer in your shop? And do you ever execute other people’s designs? Jim — not one of my immediate family members play guitar, and we’ve been making these for almost 35 years now. 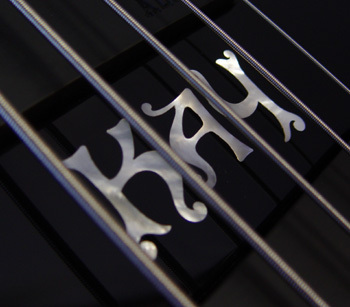 Heck, I’m no typographer, and I still play with letters After playing piano for close to 20 years, I’m ﬁnally branching out to a bass guitar. Feel free to email any questions about building to me. I really like the way Randy’s suggestion for ending the A at the baseline ended up. I’m trying hard to clean it up, but not lose the funky hand drawn aspect and the original character of my mom’s letters. Jon — when something breaks on install, we have to explain to the customer about the upcoming delay. In the case above, he decided it was so minor he wanted to keep it the way it was. That inlay is only about an inch across (and it’s under the strings). Otherwise, it must be removed with a rotary cutter and a new inlay gets made. There can be casualties all along the way. We almost always hand letter the designs. We might start with a font to get some general proportions, but since we’re custom making everything, we ﬁgure even the lettering should be unique and reﬂect the individual we’re making it for. The oval is a sterling silver wire and the letters are cut from mother of pearl. He sent in a rough sketch of his idea, then we worked it to the ﬁnal design. The oval is ebony with sterling silver wire. The bass clef is golden mother of pearl. 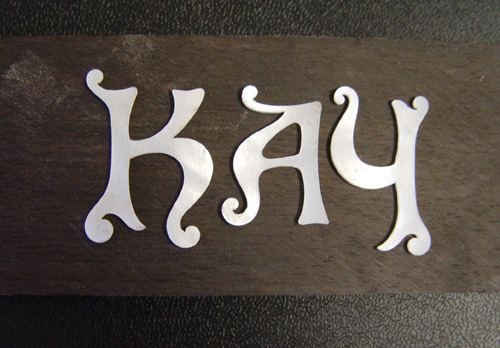 The E and the stem of the D are black Tahitian mother of pearl. Just about everyone here is considered a designer. My mom, Susan, is the lead designer. On a given project, we toss around ideas until we ﬁgure who will be best suited to do the design, and to execute the inlay itself. I usually get type related projects since that’s a special interest of mine. We have been commissioned to exuecute other artist’s designs, but we still need to adapt them to suit the medium. Thanks again for the questions and suggestions. Mica, I like the direction that the Y has taken. Trust Randy Jones. (That is an instruction). To my eye it could be a little heavier or more the overall weight of the K. But then the A will be overawed…Maybe the vertical stem on the Y could be a little thicker. Maybe that’s what I mean. Your new examples are neat, I especially like the bass clef design. I found a very good deal on a PGorton pantograph. Just punch in: “used Gorton engraver on ebay”. I know this is a wierd way to access anything, but it will get you there. The opening bid asked was $399 US, s very low price, and after two days there were no bids. This is a great deal. Also enter: www.panto-gravers.com for two good machines; a Gorton and Deckel. All through the year there are quite a few opprtunities if you keep looking. We actually found we had a pantographic engraver in our old machine heap. Cleaning it up to try it out. I’ll let you know when we get some tests, our observations may be helpful when you attempt your own inlay project with shell. We’re going to inlay the bass in about a week, so I’ve got some time for more reﬁnements. I’m going to not look at it for a few days, need some fresh eyes for the ﬁnal evaluation. Thanks for everyone’s help on this project. It is much improved for the fantastic suggestions. i haven’t read all of the posts, so i don’t know if this has been tried or suggested … but looking at the last version you posted, there seems to be an akward space between the A and the Y … have you tried curving the right base of the A so it slightly mimics the curve in the Y? My eye is drawn immediately to that space, it is quite distracting. Great job with the lettering otherwise, though. Internal server error time — will try again later. 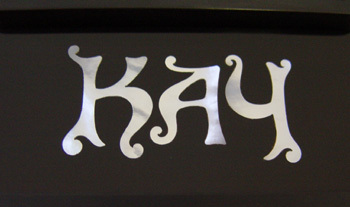 Maybe too little, too late, but: Instead of ﬁghting the large negative space at the bottom of “AY”, you might try giving it a companion at the top of the “KA”. These are just arranged on an unﬁnished piece of ebony. I need to work out the ﬁnal spacing still. Mike was the artist who cut the letters from the shell. He really liked cutting the upper left curl on the “y” best, but it took 3 attempts before he got a letter without a fracture. The ﬁrst one broke at the upper right, the second had an unseen defect at the bottom of the bowl. The third came out great. Sally, that space has been bugging me ever since I started this project. Any attempts I’ve made have made to ﬁll that space made the overall look too “frilly” for both my taste and the customer’s. We swung the vertical of the a out slightly towards the y and it did help some. Hrant, the suggestion for a complimentary negative space is interesting. There already is a good sized space at the top of the “Ka”, but it’s not demanding enough attention to counter the open space on the “ay”. Even though the shell is already cut, I’m going to explore this a bit further (after TypeCon!) to see if I can get an even better solution before we actually sink the shell in the wood. I won’t mind having an extra “a” around if I can ﬁdn something better for this project. No picture for me today. I’ll try again another time. Well darn. I use Discus for my own company’s forum and have successfully posted hundreds of photos I keep getting the Internal Server Error message. Here’s a link to the photo on my own server. A happy coincidence was ﬁnishing the project and shipping on Kay’s birthday, funny how things work out sometimes. Seeing the third photo of the whole thing makes me appreciate the symbiosis between the letterforms and the guitar’s body. Thanks, Hrant, I am really pleased with the result. Danny (the customer) was really touched and I’m so glad that he loved it. I brought a broken y to TypeCon and showed it to anyone that would look at it. Mica, it looks great. It’s expecially neat to see the inlay in place with the strings crossing through. that alone really gels the whole production. Keep sharing these. Enlightening and fun from start to ﬁnish. Superb! The letterforms work wonderfully well with the sculptural shape of the body. Thanks for sharing your process.